Midwest in the fall. Legendary Rhythm & Blues Cruise in October. There will be a large promotional campaign to blues, americana, and roots radio programs. After A While is the new collaboration between legendary soul singer, Wee Willie Walker and The Anthony Paule Soul Orchestra. This recording features 8 original tracks and 5 carefully selected covers. After recording for Goldwax and Checker labels in the 60s Walker settled in Minneapolis and was rarely heard outside of Minnesota. In the last few years he has emerged with new recordings, which have garnered accolades from critics and fans alike. Although Willie's career spans six decades, After A While is his debut as a songwriter and co-producer, making this a truly collaborative effort! 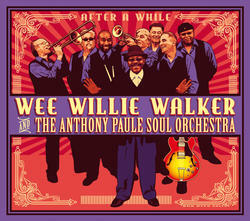 The Anthony Paule Soul Orchestra provides the perfect foundation for Walker's deep blue soul vocals. This recording is a must have for fans of blues and soul music!